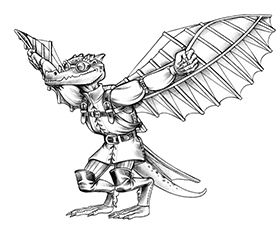 A veteran of TSR and Wizards of the Coast, Steve Winter writes the Howling Tower blog and shares his thoughts on the Kobold Press blog. Always well-reasoned and thought-provoking, his work in RPGs incites discussion rather than just more edition-war rage. The kobolds bow to him with deepest respect! A veteran of TSR and Wizards of the Coast, Richard Pett writes adventure paths for Paizo, smaller adventures for Open Design, and delivers delightful and offbeat tales and game tables in the Whispering Homunculus series. These have proven so popular, they have been collected in the Your Whispering Homunculus book and PDF. Bizarre and whimsical and veddy veddy British, it’s gaming with dark humor and sly amusement. Check out the slithering vileness of the homunculus! See all Whispering Homunculus articles », or pick up the book today! As a practicing bladesmith, Todd Gdula knows what’s he’s talking about, and he will smack down nonsense like a bar of pigiron smacks down a fencepost. Only, you know, with more deadly force. His practical knowledge and gaming background combine to provide a unique perspective on the making and use of human-powered melee weapons.